Isaiah Montgomery was born into slavery at Davis Bend, the plantation of Joseph Davis, the brother of Jefferson Davis, the president of the Southern Confederacy. His father, Benjamin, had managed the plantation for Davis until the end of the Civil War and was able to purchase it after the war. He established a prosperous colony of fellow freedmen for several years, but agricultural prices fell and severe winter flooding ruined their levees. When his loan fell overdue, the property was sold back to the Davis family. Ben Montgomery died in 1877, but his dream of establishing an independent black colony was taken up by his son Isaiah, who later founded the settlement of Mound Bayou. Montgomery purchased 840 acres situated midway between the Memphis and Vicksburg railroad lines. 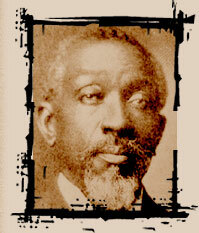 He named the settlement Mound Bayou after a large Native-American mound located at the center of the colony. The first settlers cut down trees, drained bayous, built up the land, fought off wild animals, and lived as frontiersmen. Using axes and dynamite, they transformed the wilderness into farmland, building crude log cabins and selling timber for cash crops. Women and children worked for whites on nearby plantations to earn money. When the colonists, many of whom had been slaves in Mississippi, complained about the rigorous conditions, Montgomery challenged them: "You have for centuries hewed down forests at the request of a master. Could you not do it for yourselves and your children into successive generations that they may worship and develop under your own vine and fig tree?" In 1890 Montgomery was the only elected black representative allowed into the Mississippi Constitutional Convention, which was called for the express purpose of disfranchising blacks. At the convention, Montgomery spoke in favor of the measure, winning the applause of whites and the anger of many blacks. Whatever his reasons for doing this, his town continued to prosper. Mound Bayou eventually grew to some 4,000 inhabitants, with 30,000 acres of land owned by the community, producing 3,000 bales of cotton and 2,000 bushels of corn annually on 6,000 acres of farmland. It had a town hall, a depot, lighted streets, a half-dozen churches, more than 40 businesses, a train station, a saw mill, three cotton gins, a telephone exchange, schools, and a photographer. It was the self-governing and self-sustaining all-black community that Isaiah Montgomery had envisioned. Mound Bayou received national recognition from Booker T. Washington and Theodore Roosevelt, both of whom visited and praised it. By World War I, bad investments and a weak economy had led to the gradual decline of the community. Today, Mound Bayou is a National Park Service historic site.